Recorded in the spellings of Hallows and Hallowes, and sometimes overlapping with the Yorkshire surname of Hallas, this is an English topographical surname. It originates from the Olde English pre 7th century 'halh' meaning sometimes a deep valley, and on other occasions an enclosure in a wood, or seemingly in some cases the wood itself! It is a curiosity of Olde English words that their meanings can vary right across the country. 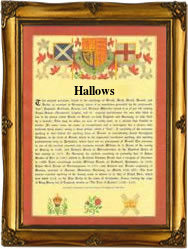 There are also a number of places called 'Hallow', which have produced nameholders. These include the village of Hallow in Herefordshire, where the meaning of the place name is said to be that of 'a tongue of land between two streams'. Early examples of the surname taken from surviving charters, rolls and registers of the medieval period include: William in le Halowe, in the Hundred Rolls of the county of Cambridge in 1276, Simon del Halghe in the Friary Rolls of Yorkshire in 1337, and Thomas Hallowes, also in the Friary Rolls but about a century later in 1446.